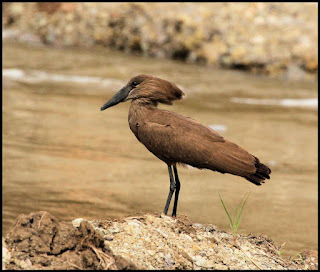 I've been hoping to see some really colorful birds here in Kenya but so far I've only seen one. But I still think the birds I've seen are interesting. I can't always take pictures of them so I've gone to the internet for pictures so you can see the ones I've seen so far. I've been interested in birds since I was a little girl. I thought all mothers were like mine. From time to time, Mom would grab the binoculars which she kept close by and run to the kitchen window. She kept track of the all the birds she saw in her bird book. I joined a bird watching club in High School and went on a few birding trips in the area. As an adult, I bought my own bird book to keep track of the birds I've seen, and my children remember me running to the window with binoculars and bird book in hand! I showed you this picture in another post. 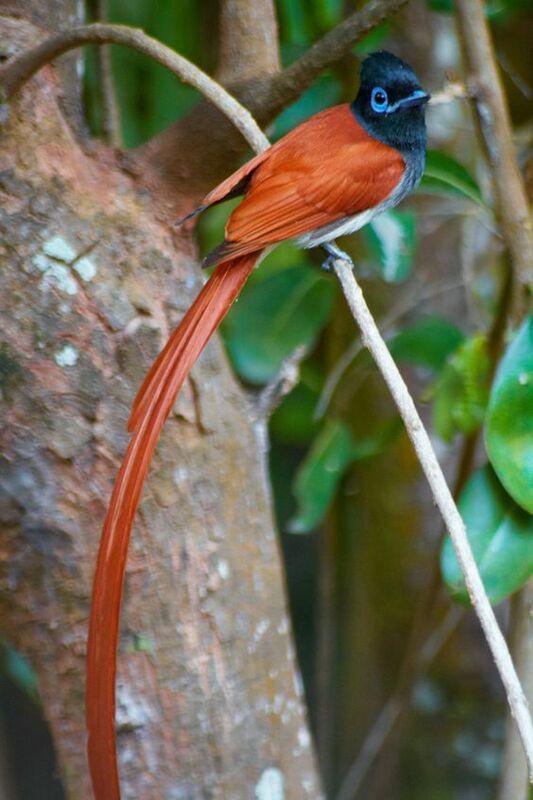 It's an African Paradise Flycatcher. It's the most colorful bird I've seen so far and it was right outside my kitchen window. It didn't stay very long so I couldn't take a picture of it. But it was definitely colorful and that long tail was gorgeous! This is a snappy little bird I see a lot in parking lots. 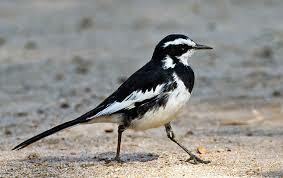 It's an African Pied Wagtail. Looks pretty sharp in its black and white suit. I've seen this bird a couple of times. It's a dark, chocolately color of brown with an interesting head. It's a Hamerkop, also sometimes called a Hammerkop or a Hammerhead Stork. 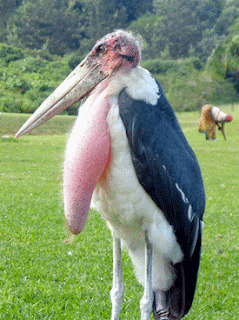 I put a picture of a Marabou Stork on one of my posts that LeRon took out the car window. In the post I called it a pelican and for some reason I haven't been able to edit that post. We see these absolutely huge birds all the time. They are definitely not what I call pretty. That long pink sac is an air sac. Not all of them have such huge sacs. But many do and when they fly the sac hangs down and looks really funny. The storks nest in downtown Nairobi near the Nakamutt Mega Store so all of the Senior Missionaries call the store "The Bird." I've seen a couple of these storks in the area where I live but not many. 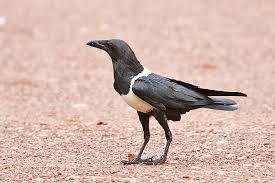 This Pied Crow sounds just like our crows back home but it looks prettier with its white belly. Lots of them where we live. I've always loved the sound of crows because it reminds me of happy camping trips with my kids in Waterton Lakes National Park in Alberta. LeRon has never liked the cawing of crows. 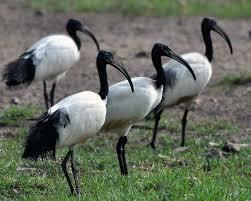 I know that the Egyptians considered these ibises as sacred, hence their name: the Sacred Ibis. But the more I've seen of them the more I don't think they're sacred at all. They scrounge around on the ground like chickens. When we walk in the early evenings, we see them in a dead tree and also on the ground in this muddy pasture place. They look dirty too. When I first saw them I thought they were so cool and I put some pictures I'd taken of them on a post. But now I think they just look like scrawny chickens! I am glad you watched birds like Mom did. I like birds, but honestly, watching Hitchcock's The Birds kind of put me off birds for a lot of years! i really like that first, colorful one with the long tail!